ARVis is a system for visualizing relations between answer sets. ARVis is now available as a plugin for ASPIDE. New configuration options, including "Project" support. Comparing answer sets becomes even easier: literals in the answer sets are colored to highlight differences between answer sets. ARVis (version 2.0.0) is now available for download. ARVis is intended for the visualization of answer sets and their relations by means of a directed graph. Each node in the graph represents an answer set and a directed edge between two answer-sets represents a relation. The answer sets (nodes), computed by a first user-specified ASP encoding, are passed to a second user-specified encoding which computes the relations (edges) between them. 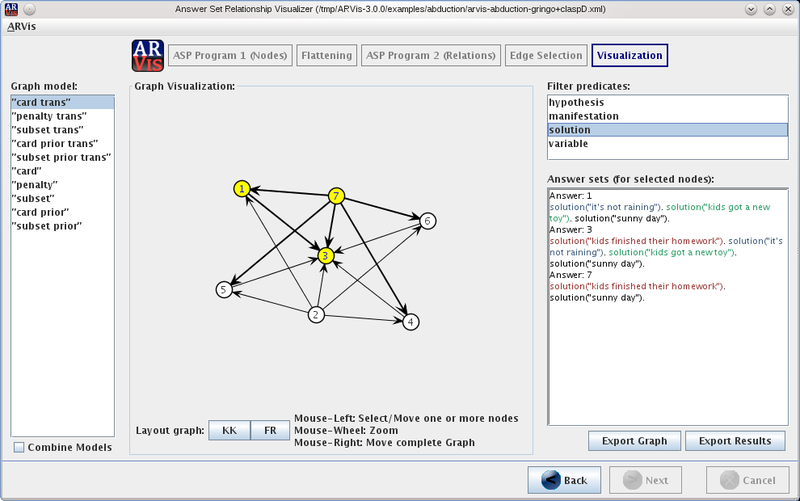 ARVis is a general-purpose tool that may be used in many areas of research, including debugging of ASP programs, representing preferences over answer sets or, in general, any problems that build upon a graph structure. The ARVis package contains several example applications. Just load the respective configuration file (.xml), adapt the solver paths, and run the example. Abduction is a famous non-monotonic reasoning formalism in AI to provide possible explanations for observed behavior. In the figure below, ARVis is used to illustrate possible solutions (expanations) of an example instance (nodes in the graph, details of selected solutions are shown on the right). Solutions can be related according to a preference relation, represented by the edges of the graph. The screenshot illustrates the results w.r.t. the (transitive) cardinality relation of solution predicates. For example, solution 7 is smaller (w.r.t. cardiniality) than solution 1 or 3. To run the abduction example by yourself, just load the configuration file arvis-abduction-gringo+claspD.xml, contained in examples/abduction. See Vispartix for more information. First, download ARVis und unzip the package. Run ARVis (depending on your system) either by double-clicking it or by running it via java -jar ARVis_VERSION.jar). Under ARVis > Preferences... set the correct path(s) to your ASP solver(s), or create a new solver configuration. Solvers have to be downloaded separately (e.g., DLV or Potassco (clasp, ...)). If you want to build a custom solver (e.g., by piping gringo and claspD together) see folder example-solver/gringo+claspD.sh for a simple example script. This script can be specified in the solver path field of the ARVis settings. Within the script, you have to adapt the paths to gringo and claspD. Each ARVis project can be stored in a separate .xml configuration file. Hence, you can adapt solver configurations independently per project. Thomas Ambroz, Günther Charwat, Andreas Jusits, Johannes Peter Wallner, and Stefan Woltran. Günther Charwat, Johannes Peter Wallner, and Stefan Woltran. Home / Kontakt / Webmaster / Offenlegung gemäß § 25 Mediengesetz: Inhaber der Website ist das Institut für Informationssysteme an der Technischen Universität Wien, 1040 Wien. Die TU Wien distanziert sich von den Inhalten aller extern gelinkten Seiten und übernimmt diesbezüglich keine Haftung. / Disclaimer.